I spent the whole day Sunday with my bee buddy and good friend, Sarah. We were in the hive yards, mitigating varroa mites—testing and treating. 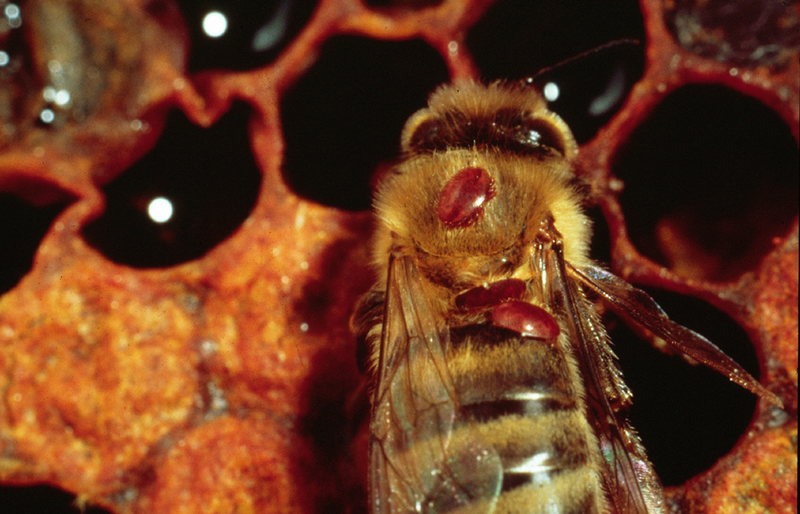 There is actually nothing worse than seeing a varroa mite on your bees up close. Like Frankenstein, they are bloodsucking little beasts, disemboweling bees and then sucking the life out of brood. Seeing them on the ghost like embryos is horrific. Recently, a bee colleague told me that proportionately it is like a human having a cat on your back. This little bee below, unfortunately, has three cats on her back. And so, we are being taught as conscientious beekeepers to learn to live with them and keep our bees as healthy as possible by remediating the little bloodsucking beasts. Having lost half my hives this past year, likely to the dreaded parasitic mite disease, I decided to hook my wagon up to Sarah and have her teach me what she is doing to survive mites. 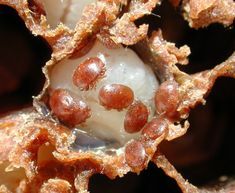 That is what she has done with treating and testing varroa mites. They are killing our bees and spreading parasitic mite disease not only through honeybee hives, but onto flowers —which then harm our beautiful native bee populations. According to the Bee Journal, bees infected with parasitic mite disease cover the entire invertebrate world in their neighborhood with this sickness. Like a big “sneeze”. And so, Sunday morning, with dread in my heart for what I might find, we began the sojourn down to my hives to find out how bad it really was. We did the powdered sugar shake and roll, developed by Marla Spivak and Gary Reuter, University of MN, Dept. Of Entymology. You shake about 200-400 bees into a bucket, scoop a fluid oz. of about 100 bees into a jar with a mesh cover and powdered sugar. Then shake them for a minute. When the bees are coated with white sugar, you dump them out. Wa la, the mites have dropped off the bee’s bodies, slippery from the sugar. You count the mites and use the chart to determine how many mites per 100 constitute the percentage of mite infestation in your hive. You then put the bees gently back in the hive for their mates to lick them off. This part of Beekeeping is no fun at all. Sarah and I both agreed, that what is arrayed against bees and beekeepers these days does not bode well. The first hive was as I had suspected. About 15% infestation. High. They would not live through the winter without intervention. They are my amazing honey-makers. I’ve pretty much gotten all my honey from this hive on 80 acres of organic clover and alfalfa. Don’t worry, honey friends, the comb for honey is mite-free. It’s the brood and bees that carry the mites. The comb is like butter. Subsequent hives had less mite infestation. All had healthy brood and good laying queens. Thank God for that. As we go into winter, healthy queens are essential. Eight hours and seven hives later, after testing and treating with “soft” treatments—essential oils, thymol, oregano and creosote in particular—we left our hives, filthy, sweaty and exhausted, but happy at all we accomplished. Thank you especially to Sarah’s friends Barbara and Ken, who welcomed us in for water to refresh our flagging bodies and spirits. They offered us frozen watermelon pops and almonds. We sat on their couches, with lovely Oriental rugs at our feet, 4 pit bulls and a Shiba Inu, making light conversation. It was a welcome break. Sarah’s secret to her successful hive survival? Monthly testing/monitoring and treating as needed. I liken the increased vigilance needed for bees to the current state of affairs in our country. Bees, as the ongoing canary in the mine, are showing us how sick our environment has become. It is not sustainable for human, bee or creature. We must watchdog our communities to ensure healthy air, water, soil and food, healthcare and education for all. Without these things, our communities will surely suffer and die. 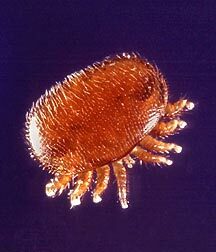 Need I say anything about how the varroa destructor parasitic mite mirrors our current political situation? We must be vigilant. Pay attention. Do not go to sleep. Act on behalf of life. Thanks so much, Anita and Sarah. I learned so much from this. Thanks to you both for the very important work that you do.